Despite limited natural snow on much of the lower kilometres of the Marcialonga course, the Italians succeeded in working a miracle and provided 70km of double ski track to run the mighty Marcialonga, much to the delight of skiers and locals alike. Significant snowmaking operations in the cold sections of the valley followed by an incredible logistical exercise to truck snow to thin areas and across the many village roads made a superb course. As it was Australia Day (Australia’s national day) a team photo at the start line was in order before heading off towards Canazei (18km). The Marcialonga trail follows the valley gradually uphill which was a great warm-up for the legs. The snow became very intermittent with a few very cold and windy parts. Skiers were rewarded with stunning vistas of the Dolomites that began to poke out of the clouds as we neared the turn around at Canazei. The tracks were perfectly groomed and held up very well after over 6000 skiers. After Canezi there was lots of opportunity (30km) for double poling as the track began to descend back down towards Moena criss-crossing the rushing creek numerous times on narrow bridges. However as the day warmed up the snow surface changed and the classical tracks got wider and icier making it difficult to keep the skis going straight. The legs were shaking, wobbling and working hard and skiers kept changing tracks in search of easier tracks to ski on. Us slower skiers could only dream of the pristine tracks of the elite and faster skiers. The downhill at Soraga was well-controlled allowing skiers plenty of space to descend safely on the icy surfce. Skiing through a huge tent that was a food station at Predazzo was novel. The ice fountains in Moena (36km) provided an interest point as did knowing you were over halfway in distance. (But it would be nice for large kilometre distance signs every kilometre) Winding through forested sections and numerous villages provided lots of interest to skiers. It also provided great viewing points for significant numbers of enthusiastic spectators who cheered us on with “Op, op, op.” A few times keen Italians had looked up the start list and were calling my name which gave me added incentive to ski harder. In the later part of the course there were more numerous refreshment stops at each of the tiny villages which a bonus for tired skiers. A lap of the stadium at Tesero and onwards down until finally reaching Molina (63km) the lowest point of the course. A short couple of kilometres back up river then cross the river for the final time. A final snack and drink (shot of coffee for those in need of a boost) and a re-wax for those who wanted extra grip and then up, up, up, 2.5 kilometres of solid climbing initially via a gully then winding between the 3 storey buildings of Cavalese through deep sugar snow but provided a magical finish especially being cheered in by an exuberant crowd, many hours after the winners had finished. 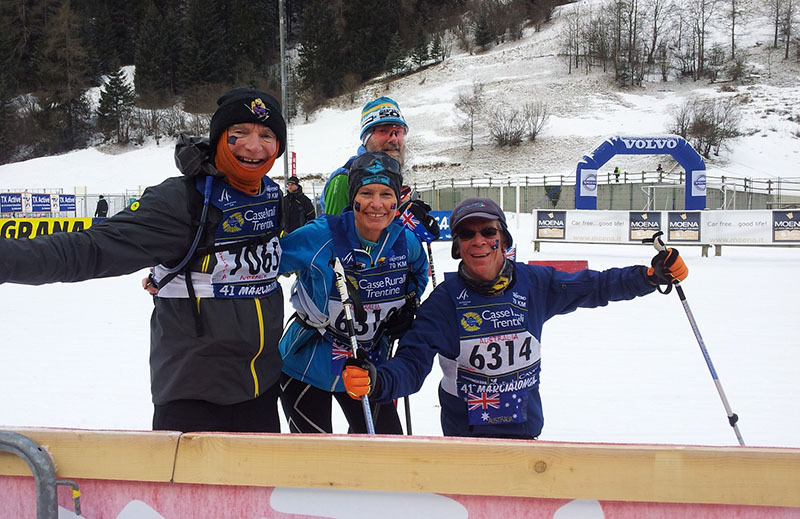 It felt absolutely awesome to complete the final down sprint through the Marcialonga finish line. The Marcialonga, a truly brilliant race of unbeatable valley character involving so many small towns is most deserving of the prestige that it receives. 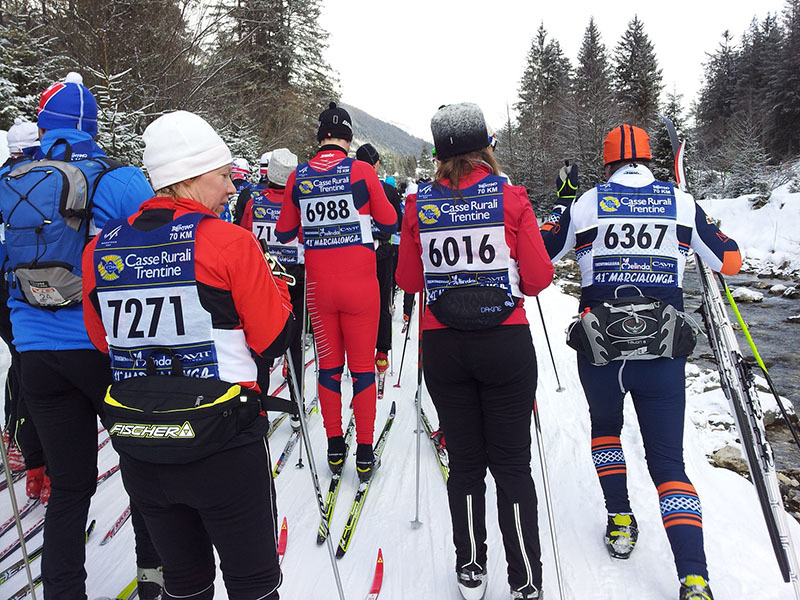 A few interesting tidbits about the Marcialonga: a huge number of Norwegain groups participate in the Marcialonga. Also, on checking my GPS watch after finishing the Marcialonga the elevation gain was 867metres whereas the 42km Dolomitenlauf (at Obertilliach) elevation gain was 806 metres however the Dolomitenlauf had felt significantly hillier. There is lots of discussion and controversy about the availability of bibs for the Marcialonga. Fortunately for us Bruce and I had purchased our bibs through making a hotel booking for more than 3 nights back in March 2013. The other 3 members of our group missed out on entries but managed to secure bibs by advertising on Marcialonga Facebook several weeks before the event. It would be great if independent travellers from afar could more easily obtain bibs and be able to stay in their choice of cheaper accommodation making the Marcialonga more affordable and attractive for those from a long way away. 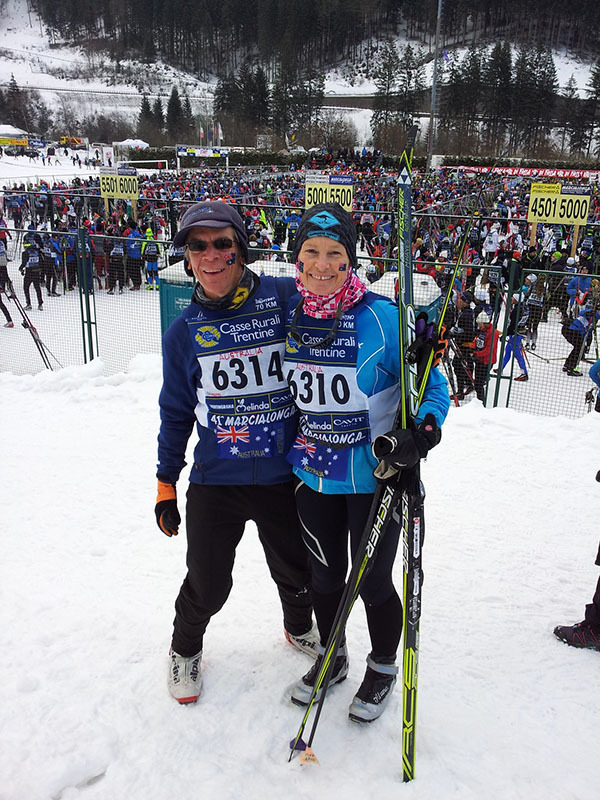 A few of the Worldoppet Masters who completed the 2014 Marcialonga include: 70km-Jay Weiner 7:18, Bruce Wharrie 8:34, Hannes Larson 7:34, Robert Palliser 5:20, Grant McLeod 7:24, Doris Truman 6:22, Ronice Goebel 6:06, Marg Hayes 6:34; 45km-Liudmila Kolbanova 4:17. Sorry if I missed naming you. Please let me know Masters intending to participate in future races so I can add their names to the list. This entry was posted in Race reports 2014. Bookmark the permalink.